Tomorrow as part of the Harbour Carnival celebrations where we will be with a GSPCA fun games stall, they have planned at 9.45pm along the seafront a firework display. Also in Herm on Saturday at around 10.30pm there is also a firework display planned. Tomorrow their is a private display at St Pierre Park Hotel at 10pm and on Liberation Day Saturday 9th May the display will take place along the seafront. 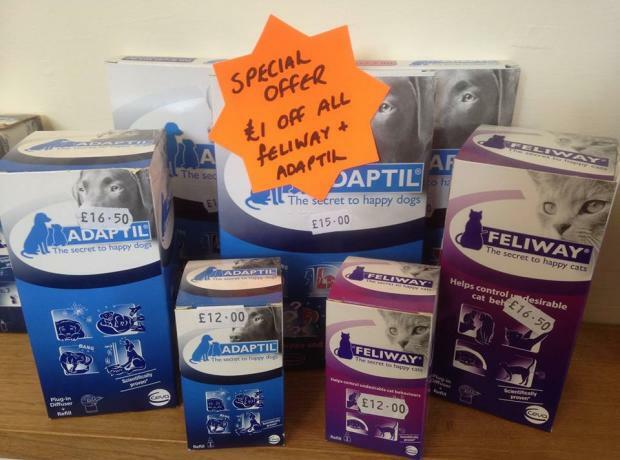 To help your dogs and cats during these very stressful times we have a SALE on the Adaptil and Feliway products which are designed to appease your pets during times of difficulty. On Friday 27th March the GSPCA will welcome Karen Green from Ceva the company that produces the Adaptil and Feliway products. Karen is visiting to talk about the many Ceva products and their uses. GSPCA staff and volunteers will be in attendance, and for a minimum £5 donation any professionals or pet owners that would like to attend can do so. To book a place please follow the details below. There are two sessions planned and you can either come along for 11am or the second at 1.30pm. On Midnight to celebrate the New Year many will be setting off fireworks, so please think of your pets and animals around you. 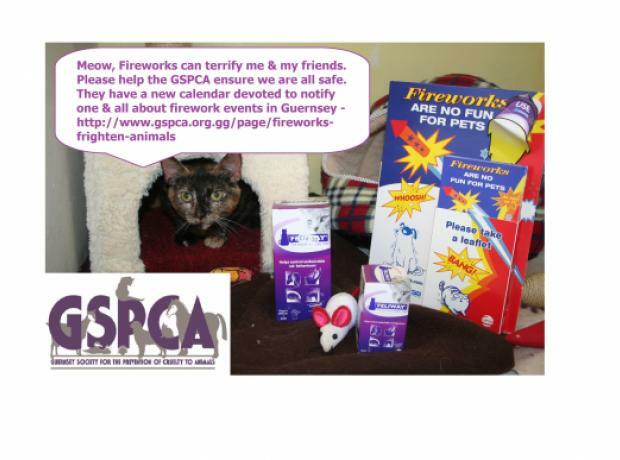 Every year the GSPCA are called out and receive stray dogs and cats during the firework period that have either escaped or run off due to being scared by the loud bangs they make. With the 5th November only two weeks away it is time to consider the pets in your household. Every year during periods when fireworks are used many animals across Guernsey can become distressed and there are a number of precautions you can take to help ensure that you help settle your pets. For the full advice from the GSPCA please click here.